Three years ago, senior Anna Perry saw the need for a pre-law club on Hillsdale College’s campus. During this same time period, Justice Brian Zahra — who serves on the Michigan Supreme Court — approached College Pres­ident Larry Arnn and Pro­fessor of Phi­losophy and Religion Nathan Schlueter about estab­lishing a Fed­er­alist Society on Hillsdale’s campus. In November 2016, Hillsdale became the second under­graduate program to have a Fed­er­alist Society on campus. Schlueter, the director of the pre-law program and adviser for the chapter, said he loves that Hillsdale has a Fed­er­alist Society. According to its website, the Fed­er­alist Society for Law and Public Policy Studies was founded in 1982 and is made up of con­ser­v­a­tives and lib­er­tarians ded­i­cated to reforming the current legal order. The society is a mem­bership orga­ni­zation that fea­tures a student division, a lawyers division, and a faculty division. Exec­utive Vice Pres­ident of the Fed­er­alist Society Leonard Leo said the Fed­er­alist Society creates an envi­ronment where people can gain a deeper appre­ci­ation for the United States’ con­sti­tu­tional system and the ways it con­tributes to freedom and well-being. Schlueter said that Leo is credited with selecting most of Pres­ident Donald Trump’s court appointees. Today, only three under­graduate pro­grams have Fed­er­alist Society chapters. Rice Uni­versity started its chapter in 2013, fol­lowed by Hillsdale College in 2016, and Princeton Uni­versity in 2018. Leo said most uni­ver­sities and col­leges with law schools have Fed­er­alist Society chapters, and the under­graduate stu­dents can par­tic­ipate in the law school’s chapter activ­ities. Prior to starting a Fed­er­alist Society on campus, Leo said the senior man­agement looks at the program’s pro­posal. 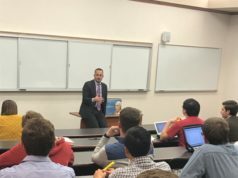 Vice Pres­ident and General Counsel of Hillsdale College Robert Norton — who has served on the lit­i­gation exec­utive com­mittee of the Fed­er­alist Society — said it was a logical step for Hillsdale to have a Fed­er­alist Society chapter. “If there was a college worthy of some des­ig­nation of being an out­standing potential Fed­er­alist undergrad, Hillsdale College stood head and shoulders above other choices,” Norton said. 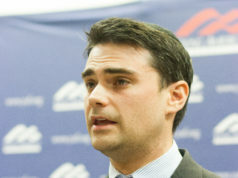 He also said Hillsdale’s rep­u­tation con­tinues to grow in the legal field. Perry, who was the first pres­ident of Hillsdale’s Fed­er­alist Society said the chapter’s first event included attending the Agraino Award Dinner for the Michigan Lawyers Chapter of the Fed­er­alist Society in November 2016. After helping Hillsdale start its Fed­er­alist Society, Zahra bought a table for 10 Hillsdale stu­dents to attend the dinner and be rec­og­nized. Perry said she and the other stu­dents net­worked with appellate judges, federal judges, and Michigan Supreme Court judges. Perry said the chapter began recruitment in 2017, which was dif­ficult because it was the middle of the year. At its first meeting, Perry said about 75 stu­dents showed up. Since 2016, the chapter has col­lab­o­rated with Hillsdale’s Career Ser­vices to bring in speakers and people to help stu­dents preparing for the LSAT. “Our main campus presence, even for people who aren’t going to law school, comes from speakers that we’ve had,” Perry said. One thing Perry has learned in the past couple of years is that she can tell the speakers to give a graduate-level pre­sen­tation because Hillsdale stu­dents already have a strong foun­dation in under­standing the Western tra­dition. 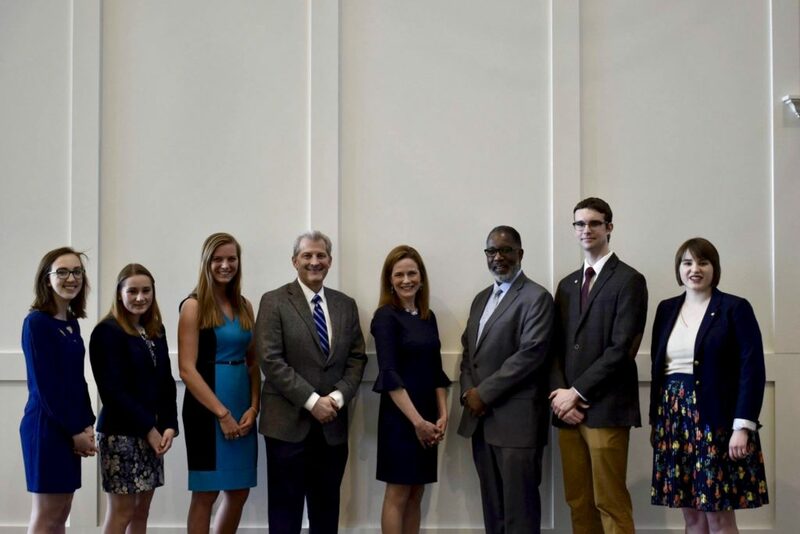 Abigail Allen, the Hillsdale chapter’s former vice pres­ident, said the Fed­er­alist Society has given her the oppor­tunity to build a strong network with other members. Allen will be attending the Uni­versity of Notre Dame Law School this fall. She said the network she has built within the Fed­er­alist Society has given her con­fi­dence going into law school. Last spring, Allen invited U.S. Circuit Judge Amy Barrett, a pro­fessor at Notre Dame Law School, to Hillsdale’s campus. Allen and a couple of other stu­dents had dinner with Barrett and dis­cussed life, law, and ethics. “When I started looking at law schools more seri­ously, her influence and her ability to explain her expe­ri­ences at Notre Dame were really helpful,” Allen said. Allen also said the study groups and various speakers helped prepare her for the LSAT. For example, the Fed­er­alist Society teamed up with Career Ser­vices to bring in Josiah Kollmeyer ’14, who earned a perfect score on his LSAT and attended Harvard Uni­versity Law School. Kollmeyer gave stu­dents advice to prepare for the LSAT. The Fed­er­alist Society also brought in Daniel Cody ’18 who shared his 12-week LSAT study program with stu­dents. “We brought in job lawyers, intel­lectual property lawyers, tra­di­tional firm lawyers, people in academia with a law degree, and people in Council,” Perry said. Perry said she will be taking two years off before applying to law schools because she is getting married to her fiance who cur­rently lives in Dallas. She has learned about job oppor­tu­nities in Dallas through the con­nec­tions she estab­lished through the Fed­er­alist Society. Perry, an eco­nomics major, said she learned about how eco­nomics and incen­tives are involved in the criminal justice system. One obser­vation Perry had about the Fed­er­alist Society at Hillsdale com­pared to other cam­puses is that it does not face push back from the admin­is­tration. “We don’t have any debates that are that heated because we’re not going to find a faculty member who’s an opponent of some­thing one of our speakers talks about,” Perry said. Blake Dela­plane started the Fed­er­alist Society at Rice Uni­versity as a junior and said the first event the chapter held was met with resis­tance. 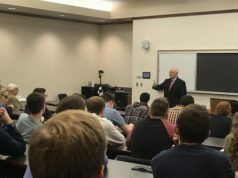 The new chapter invited Charles Murray to speak about the true meaning of free speech on campus. Dela­plane said the event shook the Rice under­graduate campus. “People began to think, ‘What does it actually mean to allow someone to speak on an issue I don’t agree with? Is this a place that is just an incu­bator for group think, or is it a place that is going to encourage intel­lectual curiosity and risk taking, and honesty,’” Dela­plane said. After the event, Dela­plane said the chapter didn’t fade because of strong lead­ership and showing respect toward the admin­is­tration at Rice. “The key to making these groups suc­cessful is focusing their lead­ership on char­acter,” Dela­plane said. Schlueter said the atmos­phere at Hillsdale has fos­tered success within the Fed­er­alist Society. In addition to success at top law schools, Schlueter said more Hillsdale grad­uates clerk on the Supreme Court than the vast majority of law schools. Norton said Arnn’s approach to edu­cation holds stu­dents to a high standard of excel­lence. This expec­tation, he said, allows stu­dents to succeed at dif­ficult law schools and earn high posi­tions in the legal field.